MS 241 C-M A compact, lightweight chainsaw with professional-grade power and STIHL M-Tronic™ technology. For professionals who need power without the bulk, the MS 241 C-M chain saw is an agile, fuel efficient and easy-to-operate package. 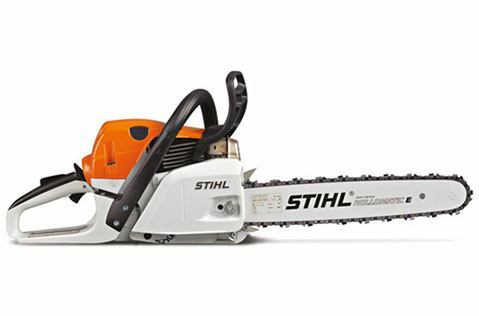 In addition to its low-exhaust operation, this chain saw features STIHL M-Tronic™ engine management technology, which automatically monitors and adjusts for changes in your work conditions including elevation, temperature, fuel quality and dirty air filters. Whether you’re professionally cutting firewood, felling small trees or doing more heavy forestry work, this lightweight saw is the one you want at your side. DECOMPRESSION VALVE: The decompression valve, also referred to as 'deco' or 'deco valve', vents compression in the cylinder for easier starting. The decompression valve temporarily reduces the compression in the combustion chamber during cranking and helps reduce the effort needed to pull the starter rope. It is opened manually and closes automatically as soon as the engine fires. STIHL M-TRONIC™: This product features M-Tronic™ (M) - a new generation of Intelligent Engine Management that eliminates the low and high speed carburetor adjustment screws, compensates for dirty air filter and changes in elevation and fuel quality for optimum engine power at all times. PRE-SEPARATION AIR FILTRATION SYSTEM: This time-saving technology boosts the efficiency of the engine’s filter system, doubling the time between air filter cleanings. Air drawn into the engine is first separated via centrifugal force, ejecting the heavier dirt particles before being routed to the air filter. This pre-separation means less dirt to be captured by the air filter, resulting in less frequent cleaning and maintenance. ELASTOSTART™ HANDLE: As built-in shock absorber for smoother starting.